In the last 7 days I have a couple of experiences with quite dramatic contrast. On the one had I have been asked for a number of people (I’ll call them Startup Groupies) for support in getting their pitch ready for investors. On the other hand I have been for coffee with a number of highly successful entrepreneurs whom are now investing as well as getting new projects off the ground. The discussion with both camps has been around getting technology based startup’s off the ground. Select an idea that you feel is worth focussing on. Tip in some of your own money & time and flesh the idea out with some quality research to turn your good idea into a great idea. Determine your desired goals for the project. Have appropriate partners (from your network) to tip in some time, IP, assets, customers and or money. Create a tangible product or service and business. Validate the product (visit potential customers to find what what they like and don’t like). Validate the business model (visit potential customers to find how to sell it to them). Speak to investors already in your network if you need investment to help you scale. The whole process runs on the smell of an oily rag and serious investors don’t get pitched to until you have a validated business that could probably survive without investor monies. Flesh out the idea with a bit of web based research. Prepare a presentation and rehearse it. Get referrals into Venture Capitalists. Now I don’t know anyone that the Startup Groupie model has actually worked for. Sure I have read tales from Silicon Valley of the hot pitch that won the money, however I also know that for every hot pitch invested in, there was another 5,000 pitches that failed to get any attention. By the way, those tales also occurred on the other side of the world in a differnet culture with a much higher level of affluence, not here where our venture finance community is much more risk averse and money is in shorter supply. However with the successful entrepreneur/investor around 3 out of 5 business started-up turned out to be winners. So a message for the Startup Groupies – Stop thinking there is a secret to avoid really hard work financed on the smell of an oily rag. Just stop it. A great evening on trends in search online, asking questions around “are search engines still effective” and “where is the money being made tomorrow”? The evening was moderated by Brendan Lewis, Chair of the Churchill Club. Search is becoming more complex as users are entering in longer and longer search terms to find more specific information (think “cheap flights Melbourne Brisbane”, rather than just “Cheap Flights”). This tends to indicate users are embracing the long tail, ie less prepared to accept generic results. Which creates a problem for Search Engines as their current algorythms tend to promote sites with lots of links, which is not necessarily what users are looking for. Human intervention is desired to make sense of the overwhelming masses of information, however crowd sourced search doesn’t seemed to have worked though. Wikia had to close down its Wiki Search and Google’s Search Wiki, hasn’t had mass appeal. But Websites with human filtering are on the increase. Filtered video websites such as Wonder How To? for instructional videos or Political IQ for politics are becoming more popular than simply searching Youtube. Wiki Answers after 3 months was getting 10 x more visitors than Wiki Search after 2 years. So what do Companies need to think about? 32.4% of visits to Australian websites are from search engines ( of which 95% are from organic search results, not paid links in search results). This means that Search Engine Optimisation should be a much higher priority than just buying the right adwords. Social Networks (Facebook, MySpace and the like) generate another 11.6 % of traffic to Australian websites so they shouldn’t be forgotten as the next highest source of traffic. It should also be remembered that Search Engines are driven by the best way of monetising their search results, which is slightly different from actually giving the best results. Therefore its possible that anything improves profitability by skewing results could be implemented (remember its all black box stuff). Because of this “increasing long tail” of search, organisations should be looking much more closely at their cost of acquisition and be careful of their adword and SOE spends. Budget could well be put to better use optimising content for being picked up in a small number of Organic Searches. Companies should also remember that just because the world wide search for “widgets” may be 1 million users, they may only obtain sales from Australian searches which could be a fraction of the former. I.e. The internet may be global but your customers are still local. Don’t get suckered into big spends. Well what are Users up to? Search engine’s are still the number one tool on the internet. Last year Australian’s went to search engines 12.5 times for every 100 pages visited. In NZ this rate is 12.2% and in the US this is 9.4%. Traditional search engine use is becoming a more complex landscape. Search terms are becoming longer, but the chance of having a successful search(clicking on a link rather than re-searching) is reducing. Last week Australians entered 3.6 M phrases into search engines. The top ten words searched for by Australian’s last year were all brands (Facebook was no 1 in Australia) and Whitepages was the only traditional brand in the top ten. In fact you had to go down 23 places before you got a non-brand search term. Realtime Search – Many organisations are now monitoring real time conversations on platforms such as Twitter and dropping in to offer recommendations when their search terms are matched. They are also monitoring conversations to understand trends and context when their search terms are used. Non Text Search – Shazam is a iPhone application that searches for details on songs it hears. When the song is identified, the user is offered the option to purchase the song at the iStore, and it actually works really well. Apple is leading the way when it comes to monetising non-text based search. A long time ago I studied Accounting at Monash University (well it seems like a long time ago). When I did it I was in a small sub group who had plenty of varied work experience. In fact at that stage I had been a software engineer, salesman, army officer and had started and had started and sold my first business (commercial light fittings). Because of this I felt my point of view on some of the management accounting tools was a little weird. Things like working out break even points seemed a little obvious and low level. The questions in my mind were more along the lines of how much do I spend on marketing (a variable cost) to get to the break even point, rather than just being worried about the maths which I felt was simplistic. Anyway recently it appears I have been giving a fair bit career guidance to people creating startups, and I had a meeting last week that reminded me of my time doing Management Accounting. I was talking to someone who had recently moved to Victoria from Queensland and was re-starting their IT services business. His response was “Well nothing, as I am bootstrapping and there simply isn’t any funds available, I am just meeting people to generate business”. I thought this is a typical entrepreneurs problem. Accounting tools such as budgets aren’t taught in a way that fits the realities of their situation well enough to be a useful tool. And on top of that, lets call him John, didn’t actually connect in his head that him “just meeting people” was a marketing activity he was conducting. You could almost see the light bulb click on above his head. John was working around 60 hours a week on his business. It appeared that he spent about one day a week meeting people which translated to about 13% of his time. John agreed to launch a service business into a new market that simply wasn’t enough. But how much is the right amount to spend on Marketing? I might have a crack at that next week. In hindsight though the Accounting does come in extremely useful for entrepreneurs, you just have to adapt the tools for your situation. Is your SEO expert ripping you off? There is a nice conversation running in a LinkedIn group called “On Startups – The Community For Entrepreneurs”. The conversation is titled – Is your SEO expert ripping you off? If your competitors are doing it too (likely), are you both paying for something that doesn’t generate a competitive advantage? Nobody outside of Google actually knows how their algorithm works. Getting IT people to do marketing is just scary as they forget people have lives offline. Every web developer in the world has hopped on the SEO bandwagon. Anyway 4 techniques mentioned for monitoring your SEO effectiveness (the bang-for-the-buck-o-meter ). Monitor your keywords monthly on Google to see whether you are actually paying for movement in your ranking (obvious). Don’t just search on your business name as that’s almost pointless. Find out who links to you. Google takes into account the number of “high ranked” sites that link to you. A link from Craigslist can instantly boost your rankings, while a link from Bob’s House of Junk has no effect. Type “link:www.churchillclub.org.au” into Google to have a look at who links to the Churchill Club. Ask your SEO expert for a monthly report. Get a baseline report of where your website stands before optimisation began, then request regular (monthly) reports detailing ranking movement. Do we still need experts? So yesterday I got emailed a request to fill in a survey. so apart from the fact that the design was just awful (bright green) and no corporate identity, the construction of it was just terrible. Wow, what a completely rubbish survey. It gave me the strong, over riding impression that the survey author is running out of money and ideas. In 1982 I realised that no matter how hard I try, art software on the computer (at that stage it was a Commodore64 )will not make me an artiist. In 1990 I realised, bookkeeping software will not make you an Accountant, nor even a bookkeeper. In 2009 I am reminded once again that survey software will not make you Market Researcher. We still need skilled people. Just because we are enabled to create our own content, doesn’t mean we should. So Survey monkey may allow you to knock up a free or cheap survey or two, but please don’t. The internet is a huge place and I don’t have time to deal with rubbish executions. Last weekend I went to an event called Trampoline, which was an un-conference (the attendees decide what topics are going to be spoken about at the conference). Weirdly though it got me thinking about my own office. Actually offices, as I have three. My North Melbourne office where I run the Churchill Club from, my South Yarra Office where I run my Flinders Pacific activities from and my home office where I do everything else. A workspace – but hang on, I can work anywhere. Consolidated infrastructure – But all my systems are in the cloud, and peripherals like Laser printers are now so cheap I can afford to have a couple of them. Co-workers within easy reach – But my co-workers are geographically distributed but still in easy reach due to email, skype and google docs. Meeting places – But I always seem to meet for coffee in a café or lunch in a restaurant. Chance meetings – Serendipity still happens, but for me it occurs from meeting new people at functions or in Cafe’s. Buzz – This is definitely missing for me as creative brainstorming, sharing, and camaraderie just don’t happen by yourself. So how do I get back the buzz? Well Trampoline got me thinking about about how communities are redefining organisational models. A quick bit of research and I cam across some interesting solutions to office space. 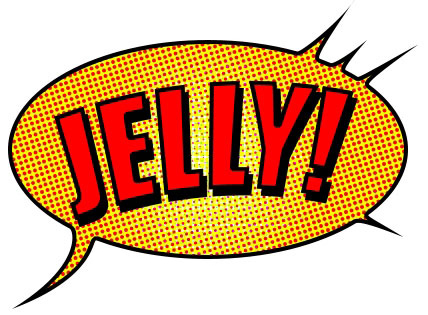 Jelly is an American concept where someone basically opens up there workspace to let others work from there. Sit around a table, get free wireless internet access, meet and bounce ideas off other independent spiritits (normally Geeks, Graphic Designers and Ideas people). Melbourne Jelly seems to happen around once a fortnight. From the blog http://blog.coworking.info/ I found out that there is slightly more commercialised version of jelly where you can share renting of office space. Its called Co working. More on a Melbourne solution can be found at Openhub . And finally I came across an organisation tapping into the “meeting in the café” type of work arrangements. In Melbourne and Sydney, Bureaux runs an interesting workspace that combines, café space, meeting rooms, hot desks and even a library. Interesting that as our work habits evolve, office space doesn’t die, it just reinvents itself to suit.